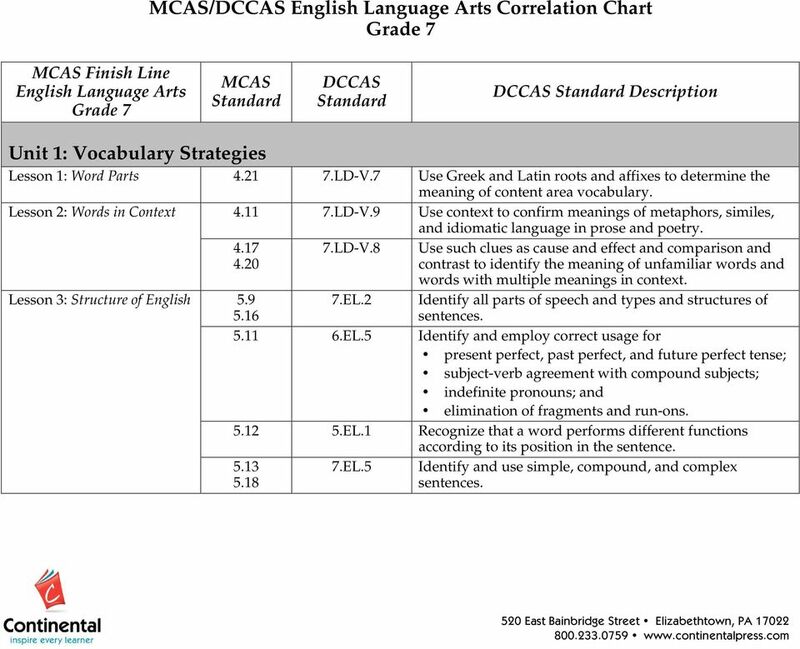 Download "MCAS/DCCAS English Language Arts Correlation Chart Grade 7"
1 MCAS/DCCAS English Language Arts Correlation Chart Grade 7 MCAS Finish Line English Language Arts Grade 7 MCAS Standard DCCAS Standard DCCAS Standard Description Unit 1: Vocabulary Strategies Lesson 1: Word Parts LD-V.7 Use Greek and Latin roots and affixes to determine the meaning of content area vocabulary. 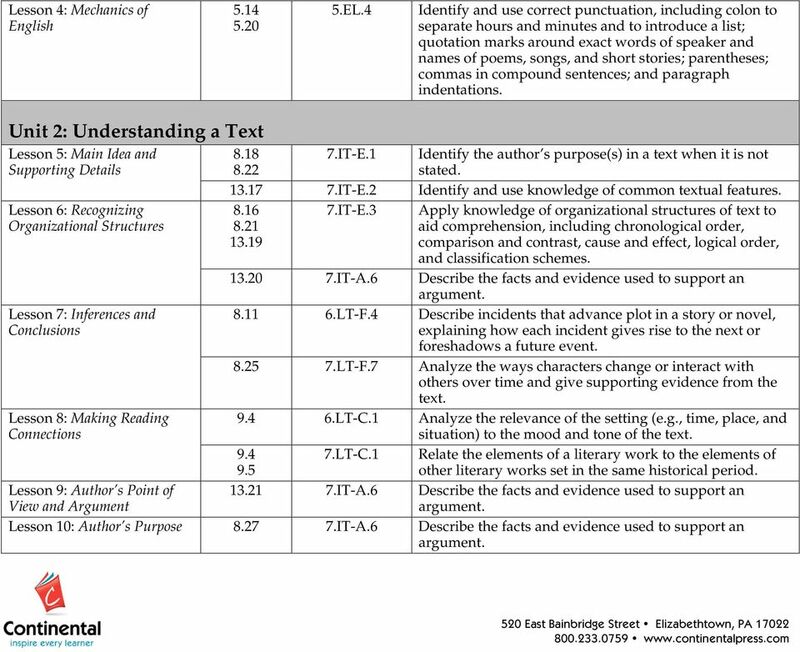 Lesson 2: Words in Context LD-V.9 Use context to confirm meanings of metaphors, similes, Lesson 3: Structure of English LD-V.8 7.EL.2 and idiomatic language in prose and poetry. Use such clues as cause and effect and comparison and contrast to identify the meaning of unfamiliar words and words with multiple meanings in context. Identify all parts of speech and types and structures of sentences EL.5 Identify and employ correct usage for present perfect, past perfect, and future perfect tense; subject-verb agreement with compound subjects; indefinite pronouns; and elimination of fragments and run-ons EL.1 Recognize that a word performs different functions according to its position in the sentence EL.5 Identify and use simple, compound, and complex sentences. 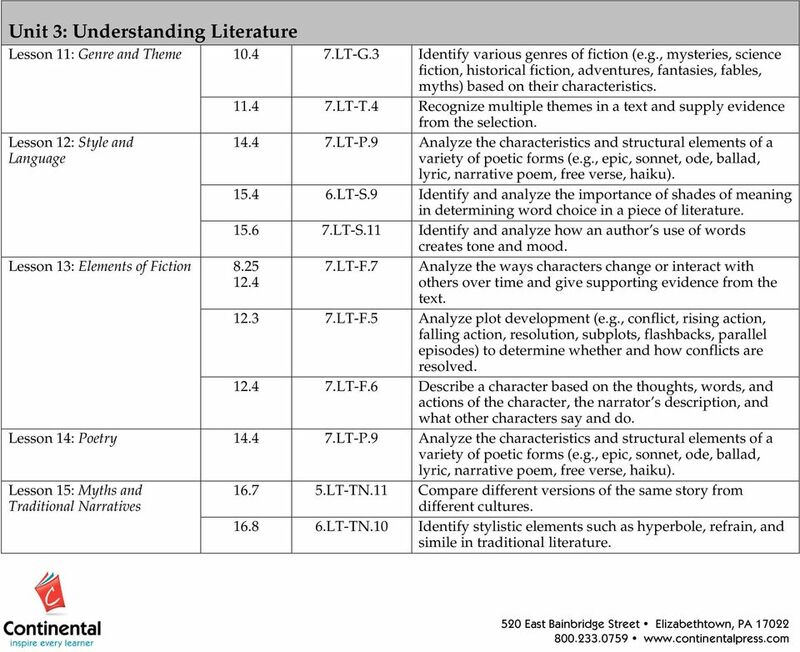 3 Unit 3: Understanding Literature Lesson 11: Genre and Theme LT-G.3 Identify various genres of fiction (e.g., mysteries, science fiction, historical fiction, adventures, fantasies, fables, myths) based on their characteristics LT-T.4 Recognize multiple themes in a text and supply evidence Lesson 12: Style and Language Lesson 13: Elements of Fiction from the selection LT-P.9 Analyze the characteristics and structural elements of a variety of poetic forms (e.g., epic, sonnet, ode, ballad, lyric, narrative poem, free verse, haiku) LT-S.9 Identify and analyze the importance of shades of meaning in determining word choice in a piece of literature LT-S.11 Identify and analyze how an author s use of words creates tone and mood. 7.LT-F.7 Analyze the ways characters change or interact with others over time and give supporting evidence from the text LT-F.5 Analyze plot development (e.g., conflict, rising action, falling action, resolution, subplots, flashbacks, parallel episodes) to determine whether and how conflicts are resolved LT-F.6 Describe a character based on the thoughts, words, and actions of the character, the narrator s description, and what other characters say and do. 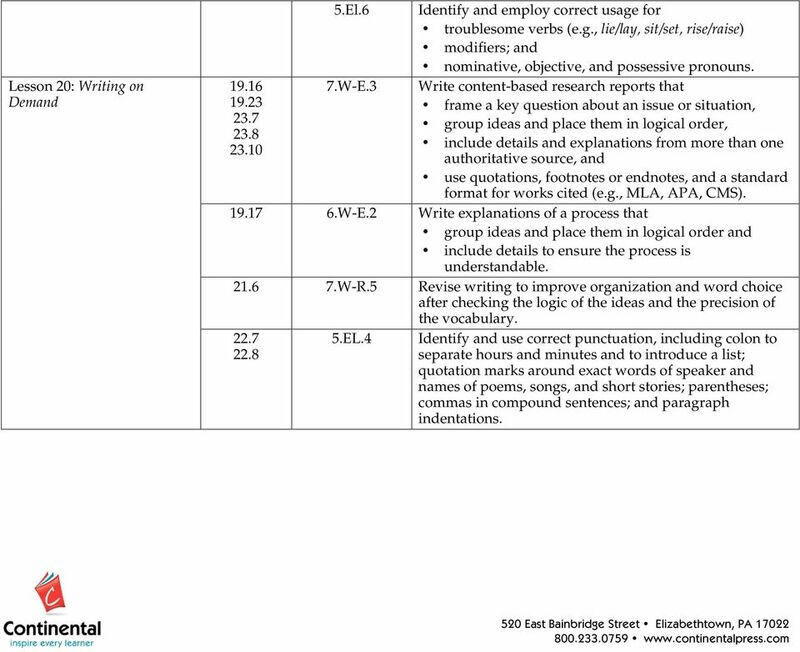 Lesson 14: Poetry LT-P.9 Analyze the characteristics and structural elements of a variety of poetic forms (e.g., epic, sonnet, ode, ballad, lyric, narrative poem, free verse, haiku). Lesson 15: Myths and Traditional Narratives LT-TN.11 Compare different versions of the same story from different cultures LT-TN.10 Identify stylistic elements such as hyperbole, refrain, and simile in traditional literature. 4 Lesson 16: Dramatic Literature LT-TN.12 Identify similarities and differences in mythologies from different cultures (e.g., ideas of afterlife, roles of deities) LT-D.10 Analyze the similarities and differences in the setting, 17.6 characters, and plot of a play and a film based on it. Unit 4: The Writing Process Lesson 17: Planning and Drafting W-E.2 Write explanations of a process that group ideas and place them in logical order and include details to ensure the process is understandable W-E.3 Write content-based research reports that frame a key question about an issue or situation, group ideas and place them in logical order, include details and explanations from more than one authoritative source, and use quotations, footnotes or endnotes, and a standard format for works cited (e.g., MLA, APA, CMS). Lesson 18: Revising W-R.5 Revise writing to improve the level of detail and precision of language after determining where to add sensory detail and rearrange text W-R.5 Revise writing to improve organization and word choice after checking the logic of the ideas and the precision of the vocabulary. 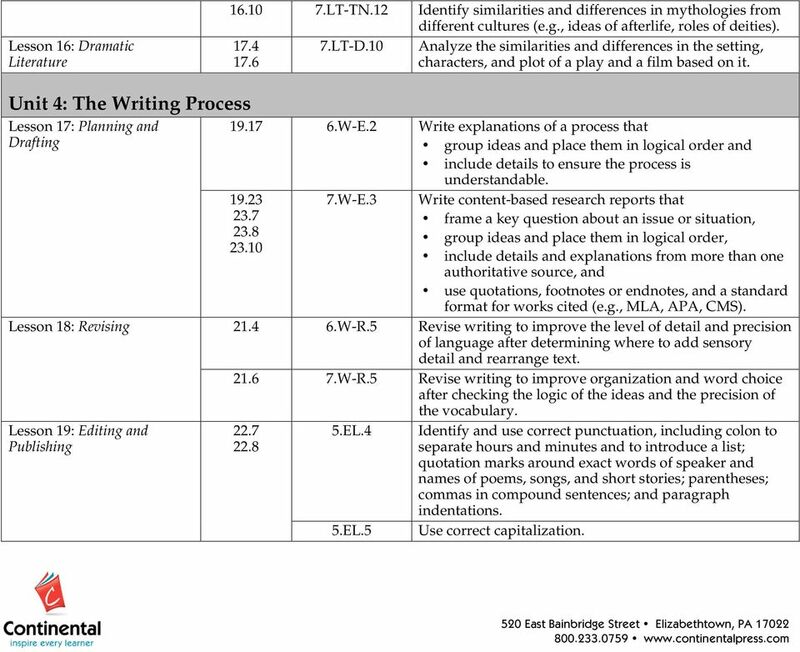 Lesson 19: Editing and Publishing EL.5 Use correct capitalization. This image cannot currently be displayed. Course Catalog. Language Arts 600. 2016 Glynlyon, Inc. Points possible: 50. Make sure you think about the explicit and the implied elements of the question prompt. What are you really being asked to do? This image cannot currently be displayed. Course Catalog. Language Arts 400. 2016 Glynlyon, Inc. This image cannot currently be displayed. Course Catalog. Language Arts Glynlyon, Inc.